When this street was a major road for vehicles, this was a main junction in the centre of the city. There are still two road signs on the wall to show this. Now it's a small open space, and full of people moving up and down the city's main street. 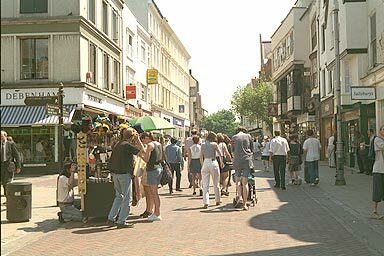 The second building along on the left after Guildhall Street had a fire in 1992, and was recorded by the Canterbury Archaeological Trust. Ahead is Queen Elizabeth's Guest Chamber and the centre of the city. Turning left takes you into Guildhall Street.